The ORIGINAL gold rose. Our popular 24 karat gold dipped roses are a mainstay in our line of preserved forever roses. Each gold covered rose is hand made and carefully articulated to ensure the highest quality. Roses dipped in gold follow a complex 50 step process before they ship. Real long stem roses are carefully preserved, and artistically arranged, then covered in 24 karat yellow gold. A very nice and unique gift idea for anyone on any occasion. Being sent roses is a lovely and emotional surprise. The unexpected arrival of an arrangement or bouquet is bound to delight the lucky recipient. They summon an aura of romance, love and passion and the bouquets can be an elegant and stunning tribute to the couples shared love and emotion. Historically, the rose has meanings of love, passion, honesty, honor, strength and innocence. They have also figured very heavily in the language of flowers, which was also known as floriography, and many subtle and hidden messages have been sent with roses through this language. As wonderful as it may be to the recipient of flowers and roses, it can also be kind of sad to watch them wither and die after you have had them for a time. Naturally a cut flower will not survive and its beauty is transient in nature. Perhaps a new way of gifting roses is in order, start a new and beautiful tradition. Roses can be preserved in silver, gold, platinum and they can be lacquered. Lacquered roses retain their color and are frequently edged in precious metals like 24 karat gold. By far the loveliest of the preserved roses would be gold dipped roses. To add permanence and elegance to your gift consider having the roses dipped in gold. Roses preserved by and covered in gold can last an eternity. These golden heirlooms are handmade and they are as original as the individual flower it was created from. The rose is made hard and strengthened by the gold preserving process so the recipient is able to hold and touch this lovely treasure. The traditional buds are dipped in gold in a process of over 40 steps and can take days. 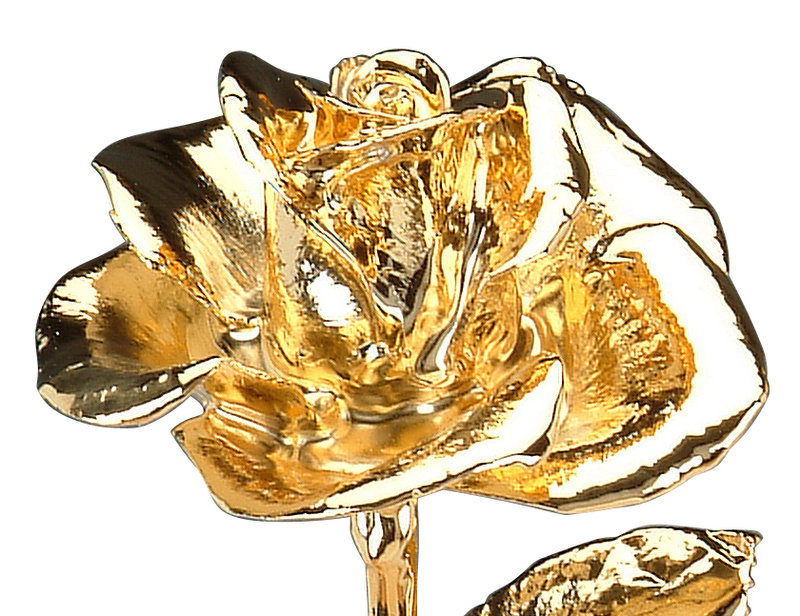 The perfect golden rose has each petal dipped separately in a process of over 60 steps and has exceptional detail. Gold is a lovely yellow precious metal and has long been associated with wealth and beauty. As a traditional bouquet of roses can wither and fade away in less than a week, these can last a lifetime is an elegant way to commemorate the richness of your love. They also come in both blooms and rosebuds and have stems and leaves. They can be placed in vases or displayed lying flat. The forever gold dipped roses are lasting gifts that can be displayed and appreciated by their recipients for an eternity. They can come up with tags for engraving and can also be engraved on their stems or even their petals. They’re available singly, and sets of two or even in half dozen and dozen size arrangements. These are a lovely treasure shore to be cherished for a lifetime. They will offer enjoyment and beauty for years to come. It is an amazing and beautiful way to show that special person that your love will last for an eternity.